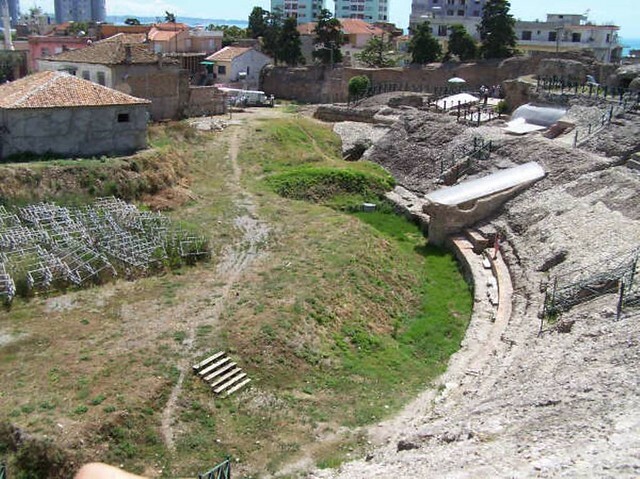 The Amphitheatre of Durrës, dating back from the beginning of the 2nd century, was discovered only in the 1960s. It is located in the very centre of the city, known in antiquity by the name of Epidamnos or Dyrrachium. It is one of the most remarkable heritage sites not only in Albania but in the whole Balkan region. The Amphitheatre of Durrës, with a capacity for 15.000 to 20.000 spectators, was in use for more than three centuries. There is no precise information regarding the cause of interruption of its activities. This could have been caused by a devastating earthquake (345-346 AD) or an edict of the Emperor Theodosius ordering the closing of all pagan centres (391 AD). Later, the amphitheatre was used for Christian religious events, as testified, for instance, by a graceful early Christian chapel. The experts have identified a variety of threats to this monument, ranging from water percolation, erosion, inadequate city planning, neglect and inadequate conservation and maintenance to lack of both financial resources and public awareness. There are a few interesting joint research projects in action, particularly with Italian counterparts, however more appropriate measures of research and conservation need to be implemented. Given its outstanding importance and its exceptional stature and beauty, the amphitheatre already attracts numerous tourists. The Association for Development of Cultural Tourism, which has made the nomination for ‘The 7 Most Endangered’ programme, is confident that the renovation and preservation of the site will have a big impact on the revitalization of the entire city, thus putting Durrës back on the map of historic sites in Europe.